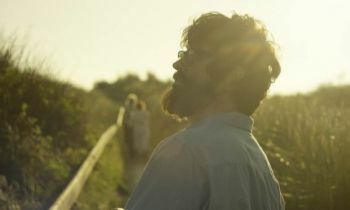 A documentary on one man's thoughts on losing his sight could have been a real downer but Notes On Blindness, a full length adaptation of Pete Middleton and James Spinney's previous shorts, defies the odds to be an uplifting one. In the early eighties theologian and university lecturer John Hull began to lose his sight and just after a last ditch operation proved unsuccessful, he set about collecting his thoughts on tape. The material on the tape would form the basis of his award-winning book Touching The Rock and is the backbone of this documentary. Using actors – Skinner playing the bearded Hull, Kirby playing his wife Marilyn – who lip-synch the conversations caught on the hundreds of tapes, Middleton and Spinney dramatise the scenes and memories recorded. A very intimate and honest portrayal of one man's struggle, Notes On Blindness may end on a high point somewhat but Middleton and Spinney certainly make one earn it. Hull, who died last year, indulges in dark thoughts. How will he work? How will he read? Will his parents be different towards him now? The burden he feels he is on his family. Not being able to see his newborn children. One Christmas scene has a depressed Hull unable to feel the joy of the opening of presents and remove himself from the room. Another has him bound into the garden when he hears his daughter screaming - the fear that he can't do anything to help her: "the discovery that you're useless." But Hull, always an articulate narrator, does what he can to be upbeat. A man of faith, he stops asking himself why this has happened to him and starts asking what he can do with it. "If I don't understand blindness it will defeat me." Middleton and Spinney keep things close and personal, mainly concentrating on the faces and letting the audio recordings do the work, but on occasion they flex their visuals. At one point Hull remarks that he likes the rain as the sound of it hitting the ground forms contours of what’s around him, and he wishes that there could something equivalent for indoors which would allow the rooms take on dimension. This leads to a stunning visual sequence when rain does indeed fall indoors, allowing Hull to 'see' the rooms he once knew so well. An immersive, first-person experience akin to the Edwyn Collins documentary, The Possibilities Are Endless, Notes On Blindness is a must-see.